My wife wants a "green" car (she has a BMW E46 325i right now) so we went out and test drove a Ford Focus Electric today. 101 MPGe, 3.5 hour charge time, 76 mile range. This is a pure electric with no gas engine whatsoever. It was a very nice car and drove and handled much more like a European car than I expected from a Ford. The ride quality was about the same as a base Boxster and the handling was decent. The power and performance (0-60mph in 9 sec) was good and more than enough for my wife who drives ..... let's just say, carefully. The interior was surprisingly nice for a base model and the only thing that my wife would want beyond the base model is leather seats which we can have done on the aftermarket. Her drive is 60 miles max one way and she has access to company Level 2 chargers at her work so range shouldn't be an issue for her daily use. For long trips, we have another BMW or my 996. I have never been a big fan of all electric cars and am surprised that I may end up with one in the driveway soon. At the same time, I haven't seen my wife this excited about a car since.... well, never. Last edited by thstone; 04-18-2015 at 09:39 PM. Imho, 76 miles range doesn't give you enough safety margin for a 60 mile drive. Better take the thing out for a heavy duty test drive first. All lights on, airco full blast, etc. Drive with a heavy foot and see if she makes it to work. Move cautiously on this. While you are located in an area with moderate temperature extremes, not everyone is, or will always use the car in moderate climes; which can significantly impact range. When Nissan introduced their Leaf plug in electric a couple of years back, they claimed a 100 mile expected range. Unfortunately, there are no currently agreed upon EPA federal standards for determining mileage on plug in car, the numbers are typically developed by the companies selling the car. 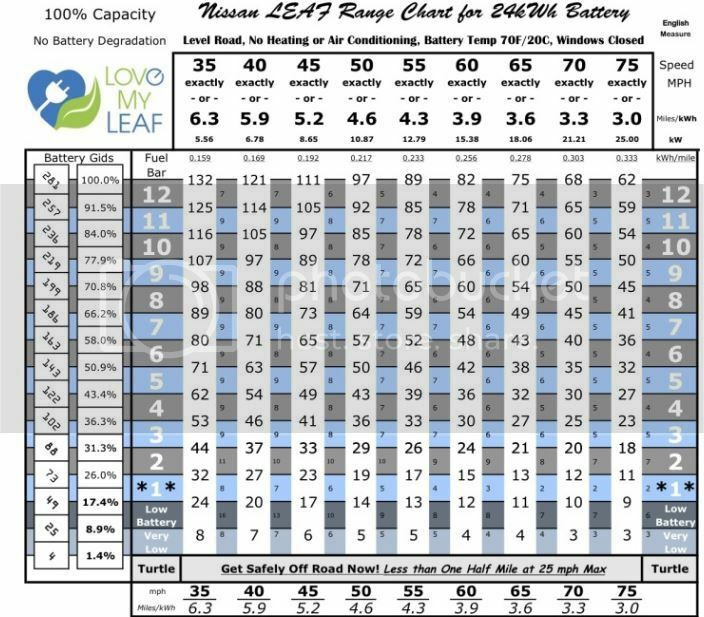 In the case of the Leaf, testers like Consumers Report evaluated the car an said that if the car was used on a 68 F day, day time use only, no AC used, and no other electrical accessories used, the car may get 60-65 miles between charges. They also noted that if the air temp dropped to 40 F, the expected range under the same conditions could drop by as much as 40%. They also noted that the expected replacement costs for the battery pack in the car should be about 30-35% of the purchase price of the car new, which was $45K at the time. A local Nissan dealer we get parts from got in two loaner Leafs from Nissan to use as demos when people drop off other models for service, to try and help introduce electric cars to conventional car owners. Within a couple of months, the dealer stopped using the cars as loaners after having to flatbed them back to the shop when they literally stopped running on the customers during the same day they were lent to them, always because the battery pack had run low on charge. Depending on where you live in LA it's going to get warm enough to effect battery life. Once it gets into the mid 90s expect a significant drop in range. I work with two people who got the Leaf so they could use the carpool lane and it summer they struggled to get 50 miles of range. After a year they both sold the car. Recently I was at a used car dealer and they had about 20 one to two year old Leafs for $16k to $17k and the sales guy was telling me they can't move them. I guess leaving the house with less then the equivalent of a quarter tank of gas isn't a good selling point. Proceed with caution. Maybe the Ford is better. Thanks for the feedback! Yes, we are proceeding cautiously and I have been reading EV forums like crazy to see what real people have to say about real life ownership experiences. The most useful piece of information that I have found is a table of range as a function of battery charge and vehicle speed. Although this was developed for the Nissan Leaf, the Ford Focus EV closely mirrors the performance in this table. The base data point is 75 miles of range at 65mph when starting with a full battery. This is what the Ford and EPA use to calculate the MPGe numbers. Of course, lower speeds yield greater range and faster speeds are correspondingly lower. The nice thing about the table is to see what the curves look like. Use of the A/C for the entire distance reduces the range by one level (71 mile range at 65mph with full battery with a/c on for the entire distance). Use of the heater can reduce range by 1-3 levels (range could be reduced to 60 miles(!) depending on heating level). Glad that I don't live in the frigid north. I talked to the dealer about our concerns and they offered a buy-back deal for an add'l $500 which would allow a 3-5 day test of the car and return of the full purchase price (less the $500) if it didn't meet our needs. This would give my wife an opportunity to test the range on her particular drive and with her style of driving. Last edited by thstone; 04-20-2015 at 01:05 PM. After dissecting the table above, we decided that my wife would continually suffer from range anxiety with the Focus Electric, so that car was off the list - along with all of the other pure electrics (she didn't want a Tesla Model S). Next step was plug-in hybrids. This weekend, we drove a Chevy Volt and a Ford C-max. Both were nice. The Volt was a little more sporty and techy whereas the C-max felt comfortable and accessible. Long range electric applications will have to wait for nano flow cells to come into wide spread use. They are much like a battery / fuel cell hybrid and one will just use a filling station without the charge time wait. I believe Li-ion batteries in hwy road going vehicles will have fallen by the wayside ten years on unless they are part of a hybrid system. Last edited by jaykay; 04-27-2015 at 02:08 PM. The new Volt is coming out soon and the Bolt is about a year off. If you can you might want to wait. If not you might be able to score a deal on the current Volt. Between the federal credit and the Califronia credit you might score a killer lease deal assuming you would consider a lease.